What Do You Get In a course? This is ground zero – your starting point. It shouldn’t take you long to read through this but it will give you a good introduction to everything and will prime you for the rest of the course. The guitar Tab section includes 3 files; two guitar pro tabs and one standard PDF tab. With the guitar pro tab, you can actually play the tab in realtime (Check out the sneak preview video to see it in action). Please note that you will need Guitar Pro to play this. If you don’t have Guitar Pro, I also included the standard tab file for you to view or print! I have also included the full Chord and Lyric Sheet for this song. All products listed are digital products and so will be delivered immediately after purchase!! Over 1 HOUR of in-depth video tutorials on recording your performance to your computer. My personal list of songs you need to know! My short list of songs that I recommend you listen to and learn to perfect this playing style. This is the list I have used to learn to play this style. UPDATE: Due to popular demand, I have now also included a full 3 different versions of the 12 page tab for this song in two guitar pro formats and a PDF format. Is this a beginner course? If I was a marketing expert, I would say that this is ‘for people of all levels’ so that I could sell more, but honestly, if you’re a complete beginner, this will probably be quite difficult for you. I assume a basic knowledge of the guitar and certain terms and move through the course relatively fast. It still can be done, with enough practice, I just wouldn’t call it a ‘beginners course’. **TIP: If you ARE a beginner and you’re determined to learn this song, the videos are private videos on Youtube so you can slow them down to half speed to make it easier to keep up with! If you are watching on mobile, you can use an app called ‘speedtube’ to do this! The course itself will take approximately 1.5 hours to complete, but once you’ve complete the course, going back through it and learning it yourself could take anywhere from a few hours to a few months – that really is up to you and how much you practice! What modules will we learn? What if I hate it (Or hate you)? Here’s some reviews that some people left on Youtube. I didn’t prompt or ask ANY of them to leave a review – they just did of their own accord! You can read the full reviews in the comments section under the Bold As Love video on Youtube! Just wanted to let you know guys the lesson by Jamie is the best you will find online. Amazing work by Jamie here. I´ve viewed and even bought many lessons for this track and not a single one gets near the quality and content of this one. If you don´t learn to play the song with this lesson you never will… Worth every penny. Keep the great work Jamie and thank you so much for such an amazing content!! Another fantastic cover! OK, when you’re ready with the lesson, I”m in. I’ve had your Bold As Love lesson for 2 or 3 weeks, been practicing for hours and you have me playing stuff I never thought I could play. It’s very demanding but absolutely the best I’ve seen anywhere… and in just a couple of weeks I’m at a different level, so Jamie, great work and . . . Thank you!! With all the free lessons you can find on youtube I’ve never really considered purchasing one. After I watched Jamie’s Little Wing video I was enticed into considering spending some money on a lesson for the first time. I did it with no regrets. Jamie does a great job bringing things down to where the rubber meets the road. I found Jamie to be a humble guy and fine guitarist (egos really turn me off). I’ve only had the lesson for less than a week now, I’ve already gone through all fourteen videos and it’s really opened some doors for my playing. Another plug I’d like to make is that I had a question for Jamie, I went on his website and used the Chat Now feature and he immediately responded. I had a nice chat with him (not just tied to my question) and sensed that he’s a true gentlemen. I purchased the 3 course bundle and I’m looking forward to spending time with the Lenny and Bold as Love lessons. Great job Jamie! And thanks! If you hate it (or you hate me), and get nothing from this lesson, no problem, I’ll give you a full refund within 30 days of purchase, no questions asked! Check out the FAQ section where you will find the most frequently asked questions. There you will also find my contact details so you can send me an email or a message on Whatsapp. I’m always here to help! **Please Note that all products listed above are digital products and will be delivered immediately upon purchase. Arrange a 30minute private Skype call with Jamie and he can provide feedback specific to YOU on exactly what you need to do to take playing this song to the next level! Upload your own video performing this song, and get at least one page of feedback from me highlighting all the things that you need to work on and ways you can improve! Awesome! You’re all signed up! Click the button below to get your free download! Copyright © 2017 Jamie Harrison Music, All rights reserved. Wait!! Before you press purchase - Don't miss out on the chance to save even more money! Over 80% of my customers end up upgrading to the full bundle later because they are so happy with the courses. If you buy the Everything Bundle today, I'll give you a 20% discount on the full bundle and the Mastery Collection absolutely free! (That's a full saving of almost $260 (£200) if you get the full bundle instead of one course today only! What's In The Everything Bundle? 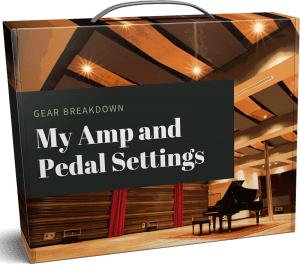 2) My Gear Rig: My guitar, amp, pedals, and accessories IN DETAIL! Plus! Get The Mastery Collection FREE if you Buy Today! You will not get the opportunity to get this discount again! !